Interesting news from Motor City probably won’t come as too much of a shock to anyone that’s used to driving hybrid cars. Unfortunately, it probably will come as a nasty surprise to many drivers that get a flat tire in the years to come. Yes, according to Detroit News, many auto makers have decided to stop including spare tires in their cars altogether. Not only that, but some car makers are getting rid of the spare wheel well altogether, leaving many drivers with little choice but to pay for expensive tows. 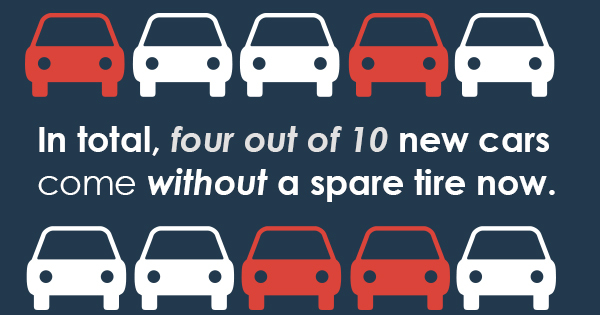 In total, four out of 10 new cars come without a spare tire now. A new study by the American Automobile Association, better known as AAA, discovered that 36% of 2015 vehicles only included run-flat tires or cheap tire inflation kits rather than the traditional spare tire. AAA says that number is up from 5% in 2006, when receiving a spare tire was still considered a given by most drivers and car companies alike. What’s worse, those kits and sealants won’t repair most kinds of flat tires. So why the change? Well, since cheating on your emissions test is no longer a viable option (we’re looking at you, Volkswagen), auto makers are desperate to do anything they can to improve fuel economy. Replacing a spare tire with a flat-tire kit cuts a whopping 25 pounds from the vehicle weight. You can check Consumer Reports for a list of the offending rides. These desperate measures are disappointing, especially considering that fuel efficient technology has been available for decades. The 2000 Honda Insight mileage set a high score at the EPA with its combined city/highway rating of 53 miles per hour — and that was a gasoline-fueled car, not a hybrid vehicle. Fuel Economy: How To Get the Best MPG as a Driver? Car companies are so desperate to trim their fuel efficiency numbers that they’re making heretofore unheard of changes. If you really want to boost fuel economy, the best thing you can do is purchase a hybrid. Hybrids are 20-35% more fuel efficient than gas-powered cars and reduce emissions by 25-35% to boot. Remember, in some models, old batteries in hybrid cars can impact performance. Don’t procrastinate when it’s time for hybrid battery replacement. Whether you drive a hybrid or not, remember there are simple things you can do to improve mileage. First, always make sure your car has regular maintenance so the engine can perform at its peak. Second, always keep the tires inflated at proper levels, and avoid unnecessary or aggressive acceleration. Finally, keep your car as lightweight as possible by not using it for long-term storage — just don’t ditch the spare tire!